I am loving my iPad more and more these days. At first, it was just a way for me to read emails. I am not a huge fan of my iPhone for apps(too small for me), so the iPad was a very good choice for this "touch" challenged mom. If you ever want a laugh, come on over to our house and join the boys in their utter glee in watching me struggle with my new iPhone! Anyway, a few favorites I'd like to share for my fellow bloggers. My friend. It allows me to make to do lists galore. I am a list girl. I make lists to make to do lists. I make lists of things I have already done so that I can just check it off, or strike through in a way to say DONE! 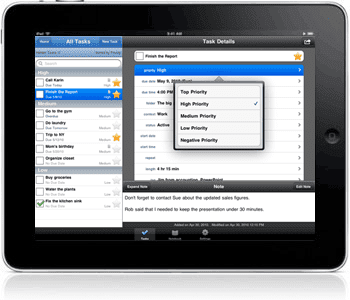 When we bought the Mac, I knew I had to succumbed to the fact that I just didn't want to work out of Outlook and Parallel programs. I hunted and searched and found this great app! I love how I can have folders. Folders for blogs, tutorials, sewing projects, shopping lists, and school projects. My favorite part? Due Dates, Notes, and Priorities! 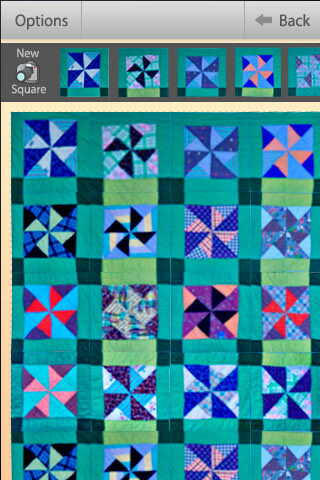 My Hotlist lets me know if a sewing order or commissioned quilt is due soon based on my priority rating. 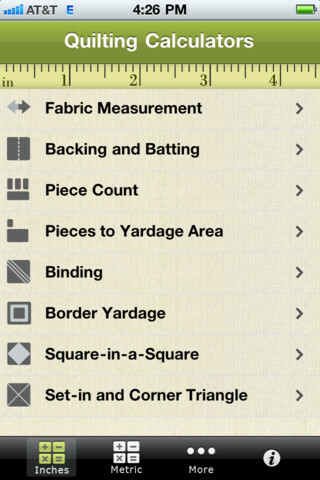 I love being able to add notes on each item, fabric requirements, applique notes..you name it! Access your toodledo account on your home computer, also. Best app ever for this "list" girl! This is a fun app! I haven't really explored it full potential because I am too busy with finishing current quilts. 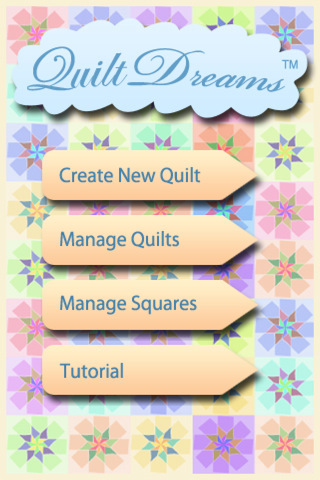 It isn't a quilt design app, but it gives you quick looks at designs, colors and layouts! I have fiddled around with a few blocks and patterns while I sit in the carpool line or a doctor's office! Coupons anyone? They will punch the code right there and then. I have also used the app coupons in conjunction with my paper fliers! This app is for when you are looking at fabrics at the store and just aren't sure if they really are getting along with each other. You simply take a picture of the fabric and place it into blocks. I need to spend more time on it to get to know it a little better! Having trouble figuring out how much fabric to buy? 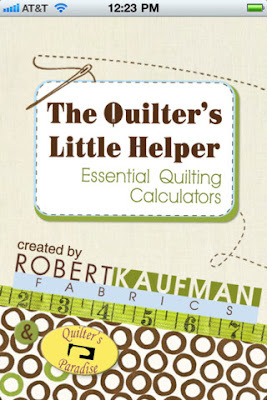 I have an awesome quilt calculator by Calculated Industries. 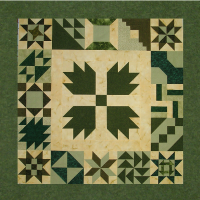 But I ALWAYS manage not to have it when I am standing at the quilt shop dreaming up a new quilt in my head! I just like the colors on the app, too. Seriously, I can never get enough of measuring tapes. I love my Photoshop elements, but occasionally, I take a photo of my projects on my phone or see something at the store and want to upload it to Facebook or my blog. However, not every photo is "ready" at that very moment and needs some editing! Hope you can have as much fun as I do with my iPad and iPhone! Know any other good apps that you would recommend to me? Heidi, I love the calculator, I have that one. I think you need Quilt Across Texas. It uses your location (in Texas only) and will show you on a map where your closest Quilt shops are. It is great when you are traveling around or stay in different city. Also, Quilters Club of America has Find QUilt Shops that is for the entire US. I found it after the Texas one! Great little iphone apps. I have had the 'robert kauffman' calculator for a while on my phone and I LOVE IT!!! 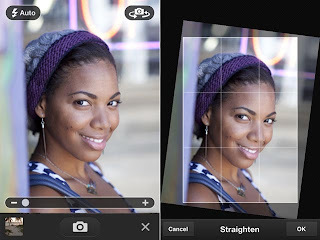 also Photo shop express is available for free for android users as well :) Happy downloading ladies and gents.